Hold onto your hats, QV readers. Remember last time, when I cooked two coordinating dishes from Appetite For Reduction? Well, I did it again! 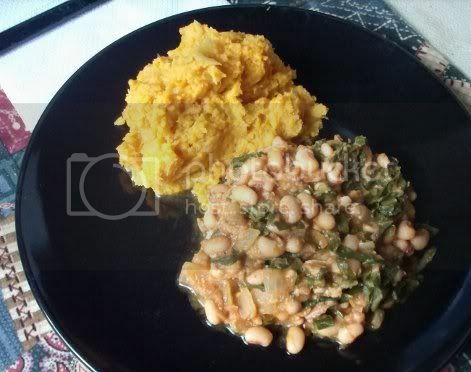 The recipe for Spicy Black-Eyed Peas & Greens suggested serving Ginger Mashed Sweet Potatoes & Apples as a side. Once I’d read both recipes over, I couldn’t resist trying them out. I’d been having a craving for black-eyed peas, so of course I had to pick up some collards to go with them! I also needed sweet potatoes and apples since the apples I keep in the house on a regular basis are for eating, not for cooking. Consequentially, I spent a bit of time with the produce scale in the store, trying to measure out exactly what I needed. The only thing I wound up with excess of was collards; the smallest bunch I could find was three times as much as the recipe called for! Not that I’m complaining. I looooove collards. They were amazing in this dish. I think I’d rank it second only to the barbecue collard wraps in Veganomicon. 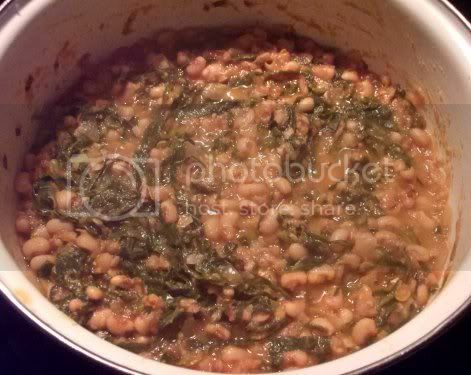 There were a few differences between it and the other peas-and-collards dish I made. This one was much more hearty and included tomato sauce, a good amount of hot sauce, and some time spent mashing the black-eyed peas with a potato masher to thicken everything up. All together, it was unusual compared to what I normally make, but in a good way. I particularly liked the thinly-sliced collard leaves for some reason. Maybe just because I like food that looks good as well as tastes good! The mashed stuff was the more time-consuming of the two dishes, but worth every minute. Most of it was inactive cooking time, though, which gave me the opportunity to put together the peas and greens while the potatoes and apples were steaming. I honestly can’t remember what kind of apples I used, because the store had a bunch of different varieties thrown together in the organic section. I want to say they were Braeburn, but all I know for sure is that they were red and not overly sweet. Whatever the case, fellow vegans…you need to make this recipe. NEED. It turned out to be one of the single most amazing things that I’ve ever eaten in my life, and I eat a lot of food. 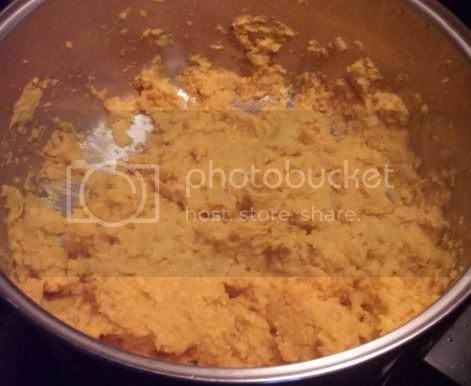 I never would have thought to mash sweet potatoes and apples together, let alone put fresh ginger into the mix. Cinnamon made sense, but fresh ginger wouldn’t have occurred to me. It’s a good thing it occurred to someone else, though, because that’s what brought the dish together. The bright zip of gingery flavor underneath the sweetness of the main ingredients was perfect. I could easily have eaten the entire pot myself. So experiment #2 in cooking coordination was a complete success. Plus we have a new favorite dish around the Quantum Vegan household! Question for the comments: What surprising flavor combinations are you completely in love with?